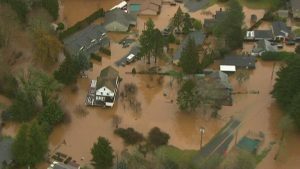 COLUMBIA COUNTY, Ore. (KGW/NBC) – Heavy rain and snowmelt has caused widespread flooding in northwest Oregon. Flood waters covered streets in Columbia County Tuesday. Homes and buildings were surrounded by water after several small creeks overflowed. Same goes in Washington County where a wall of sandbags is all that stands between a neighborhood of homes and a fast-moving creek, nearby. Throughout the county, several roads are closed because of the flooding. The National Weather Service says the area saw two to five inches of rain in just 24 hours.